Automotive Grade : Rich and Luxurious Seat Cover. It is made specifically to protect your original factory seat covers from excessive wear caused by children, dogs (pets), and from other heavy duty uses. Protects against spill, stains, dirt and any debris. 3/8 inch foam backing stretchable for added comfort, fit, and durability. Pr-Treated with a Scotch Guard (stain protector). 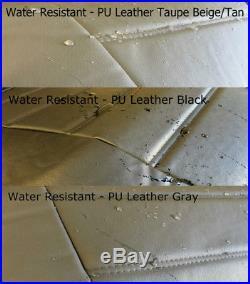 Material resistant to liquid absorption. Extra 3 Layer Finishing With Scotch Guard. Easy to Install (instructions included). Seat Style / Seat Configuration. Seat Type - Front 60/40 Split Bench Seat. Seat Style - 60/40 Split Bench with Armrest. What's in the Package? (2) Front 60/40 Style Seat Covers. (1) S-hooks Bag to Install Seat Covers. (1) Easy to Install Instructions. Customers are responsible for their choice of color, fabric and correct seat style for their vehicle. Note: Most of our seat covers are Universal size which can generally fit most vehicles with regular size front bucket seat. Minor adjustment might be needed for best fit. It's not the OEM or fully custom made product unless it says in the listing "Custom made or Exact fit" therefore it might not be exact or perfect fit. The compatibility list is for reference only as list all vehicles as Universal fit. Since even the same model and makes for the vehicle might equip with different type of seat, please ensure your seat fits the description above. Service You Can Trust We at SeatCoverShop Auto Accessories Man are Proud to offer high quality Seat Covers at extremely low prices such as Custom made Truck, SUV or Car Seat Covers that are hard to find else where at so low price. Please note the main listing photo or other photos used may be is the interior of the actual vehicle. Used for reference only to show that our custom made, semi custom made and universal seat covers may fit similar seat styles shown in the listing pictures, If you vehicle seat style matches with the pictures and listing description then proceed with the order. While we aim to provide accurate product information, it is provided by manufactures, suppliers and others and has not been verified by us. WARNING: This product can expose you to chemicals including toluene, which is known to the State of California to cause cancer and birth defects or other reproductive harm. Your total satisfaction is very important to us. PLEASE let us know, and we will do our best to help. The item "60 40 Split Front Bench Genuine 100% PU Leather Seat Cover Custom Exact Fit" is in sale since Wednesday, February 3, 2016. This item is in the category "eBay Motors\Parts & Accessories\Car & Truck Parts\Interior\Seat Covers". The seller is "seatcovershop" and is located in Sacramento, California. This item can be shipped to United States.